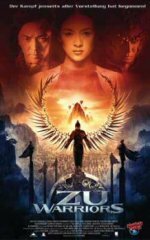 Zu Warriors release date was Friday, August 19, 2005. From Tsui Hark, the legendary filmmaker who defined two decades of Asian Cinema and Yuen Wo-Ping, the visionary martial arts master behind "The Matrix" and "Crouching Tiger, Hidden Dragon" comes "Zu Warriors". In the world beyond our world there lies a mystic realm that guards the mortal universe—the kingdom of Zu.